We can’t think of a better way to celebrate the arrival of spring than to eat asparagus. After months of cold weather and fat foods nature knows exactly what we need and provides us with cleansing foods like this one. We have been stocking up on these tasty buggers that are at their best between March and May. This is one of the easiest recipes and gives allot of bang for your buck. We prepared our asparagus in a frying pan but you can gill them on the BBQ or on a baking tray in the oven if you prefer. The best way to trim spears of asparagus is to bend the thick end of each spear until it breaks. This way you break off the woody part of the asparagus exactly where it becomes dry. For a cleaner presentation you can always cut off the ends. Grill or fry your asparagus in a smoking hot pan with a bit of olive oil until all sides are colored. You can see if they are ready by holding the asparagus (with a fork) by the end. The more it bends the softer it is, we like to keep a bit of a bite to them. Remove from the pan cover with a pinch of coarse salt and set aside to cool. Once they are slightly cooled off, grate over some Parmesan cheese, the zest of 1/2 a lemon, and a drizzle of olive oil. (You can enhance their crisp flavor by adding a squeeze of lemon juice). 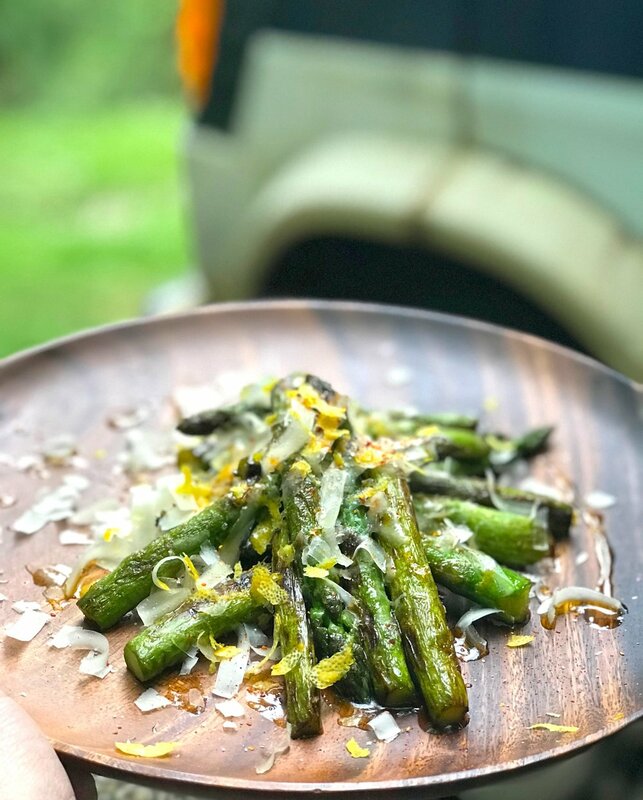 These asparagus are great served as a snack with afternoon drinks, as a side-dish at a BBQ, or just as such. We could munch on them all day, everyday.